We bought our condo at Bonita Beach Club because it is the perfect location, quiet and beautiful with lots of natural beauty. Our condo complex is the last structure on the North side of Bonita Beach on Little Hickory Island. You feel as if you are in a Tropical Paradise miles away from everyone, but in ten minutes you are in the heart of Bointa Springs with all it has to offer. The condo faces the beach. All windows, doors, and lanai face the Gulf of Mexico. Kitchen remodeled in fall 2005 with new appliances, tile, and bar. Comcast cable and HD-DVR to record your favorite programs. Surround sound. There is an ocean side 80 ft. kidney shaped heated pool, fishing dock on the back bay, two tennis courts, shuffle board, gym, sauna, charcoal BBQ, library, wild life viewing and screened lanai. Lovely spot and we enjoyed our time there. Great beach location. Very nice condo and great location on peninsula. Very happy you enjoyed your visit. Loved the property and location. We’ve vacationed in FL several times, but this condo association is on our list of top spots with wonderful sunsets every evening which could be seen from the condo window-but, of course, we viewed from the beach, which was only steps away. Lovely n clean n private beach! Really appreciated beach chairs, umbrella and towels. Pool was really nice, quiet, people were respectful-no loud noises, etc. Activities are offered and posted for those with extended stays: exercise classes, bookclub, game n movie nights, etc. Thank you for the review. I am glad you enjoyed our little paradise. Everything as advertised. Had a wonderful time. Would rent again. Just a few steps away from the beach. Nice view of the pretty courtyard plus able to see ocean from the lanai. This is definitely a bit of paradise. The condo was very clean and comfortable. It was well equipped with everything we needed. Joanne was very accessible via text and phone. The outside property was well maintained and the pool temperature perfect! We used Joanne's beach chairs and umbrella every day as the beach is just steps away. We walked the beach and watched sunsets daily. The condo complex is so quiet and everyone was so friendly. You will love it! Thank you for the wonderful review. I am happy you enjoyed your time in our piece of paradise. It was a pleasure having you as a renter. There are miles of white sand beach to explore, so watch the dolphins swim, the pelicans feed, go shelling or just enjoy the beautiful blue-green waters with a long walk. The sunsets are incredible and will stay in your memory long after you return home. You can enjoy them from your private, screened lanai that faces the gulf. So sit back, listen to the waves, watch the sunset and enjoy! 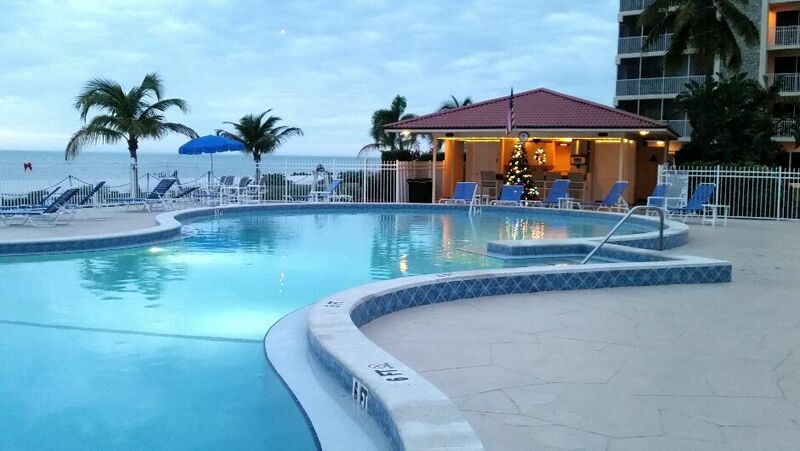 Bonita Beach is located halfway between Naples and Fort Myers.There is a fully equipped gym on site, tennis courts, shuffle board, library, and billard room. There are Boat rentals, deep sea fishing, snorkeling, water skiing, golf courses, Naples-Fort Myers Greyhound Track and Corkscrew Wildlife Center are all nearby. Virtual tour available - please e-mail for tour.